Welcome to the Ultrasound Leadership Academy (ULA) summary blog series. This week, we summarize basic cardiac ultrasound. The ULA is essentially an online advanced ultrasound education experience put on by the team from Ultrasound Podcast which brings cutting edge learning to emergency medicine personnel through a variety of interactive platforms including video lectures, google hangouts with experts, simulation, live conferences and real time scanning with a pocket-sized ultrasound device known as a Vscan. This post will focus on the key cardiac views, the pertinent anatomy and useful pearls to get started in assessment of cardiac function. This is your go to window for pericardial effusion. Remember you are looking anteriorly between the liver and anterior cardiac surface for fluid. Your probe indicator is pointed at the patient's left shoulder. Hold the probe on the top surface to allow the probe to lie flat on the patient; If you are fanning too posteriorly you will miss your view. Be sure to use the liver as an acoustic window here. Once you obtain a good subcostal 4 chamber view, twist probe 90 degrees towards patient's head (you will be sagittal at this point) to obtain subcostal long axis view and IVC longitudinally. This view will be useful for assessing volume status. In this view you will observe approximately 90% of cardiac pathology so pay attention! Use this view to assess LV function, compare chamber sizes, and localize effusions. Use the 3rd or 4th intercostal space and point the indicator at the patient's right shoulder. The RVOT, aortic root and LA should all be approximately equal in size (~2cm) if you draw a straight line through them in this view. Make sure to look posteriorly to identify the descending thoracic aorta which is useful landmark when assessing location of an effusion (more on this later). To get to the parasternal short, simply rotate the probe 90 degrees, from the probe indicator pointed at the patient's right shoulder, to their left shoulder. You will then fan the probe from the base of the heart to the apex to obtain different cross sectional views. This view is important for visualization of how the RV and LV function interdependently. You will be able to assess for increased right sided pressures and wall motion abnormalities. Point towards the base of the heart to assess the RV inflow/outflow; Look for the 'Mercedes Benz' sign in the center which represents the 3 leaflets of the aortic valve. Point over the mitral valve and you will see what appears to be a 'fish mouth' coming out straights towards you. Fan further towards the left hip to view the papillary muscles. Notice the RV crescent shape overlying the round LV; A flattened septum is concerning for RV overload. This can be a more challenging view but once obtained if adds quite a bit more information to your cardiac assessment. You will be able to assess cardiac function (EF), wall motion, diastology and valve abnormalities using this view. Your probe is placed at the PMI: the probe indicator pointed towards the patient's left axilla. Left lateral decubitus will be extremely helpful for this view. The probe needs to be as flat to patient surface as possible to obtain view of all four chambers. Be sure to glance at the ratio of the RV to LV diameter which should be <0.6. Greater than this should raise suspicion for RV overload or PE. If you are confused about which ventricle is which, look at the septum, the tricuspid valve inserts more apically than the mitral valve, making the LV appear longer than the RV. You are looking for an anechoic stripe surrounding the cardiac muscle. 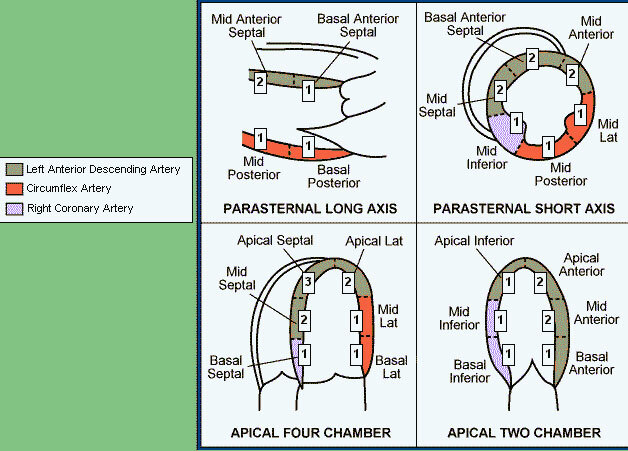 Subcostal is the most sensitive but parasternal long axis can also be used. You can grade pericardial effusions based on size ( <0.5 cm = small, > 2.0 cm = large) however rate of accumulation is more critical to possible hemodynamic compromise. You want to know if there is tamponade physiology! On your PSLA view, identify the descending thoracic aorta (DTA). If you have an effusion visible, identify if anterior to DTA (pericardial) or posterior to DTA (pleural). Think of the man 'jumping on the trampoline' where the trampoline is the RV. 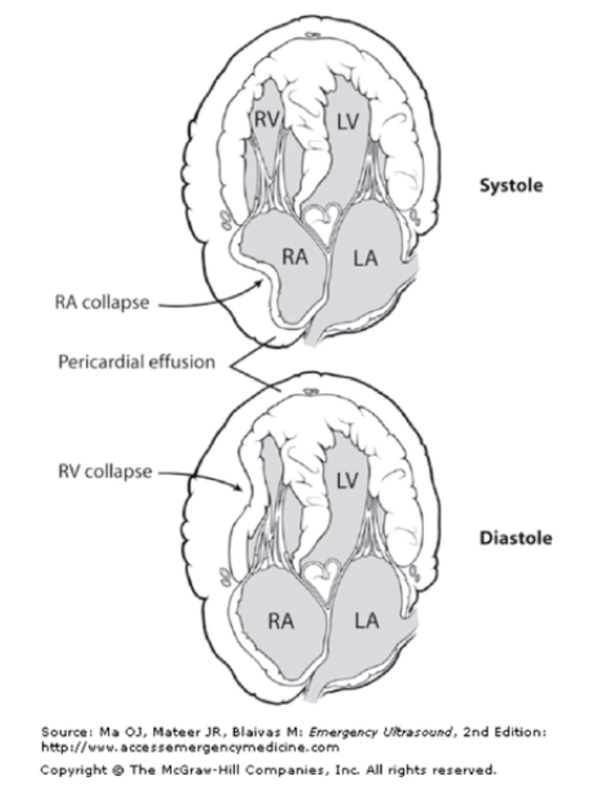 One easy way to determine if RV collapse is truly during diastole is to use M-mode via PSLA. Look for RV free wall collapse when mitral valve is open. More difficult to see as the RA is often not visualized but is usually impressive when it's there. 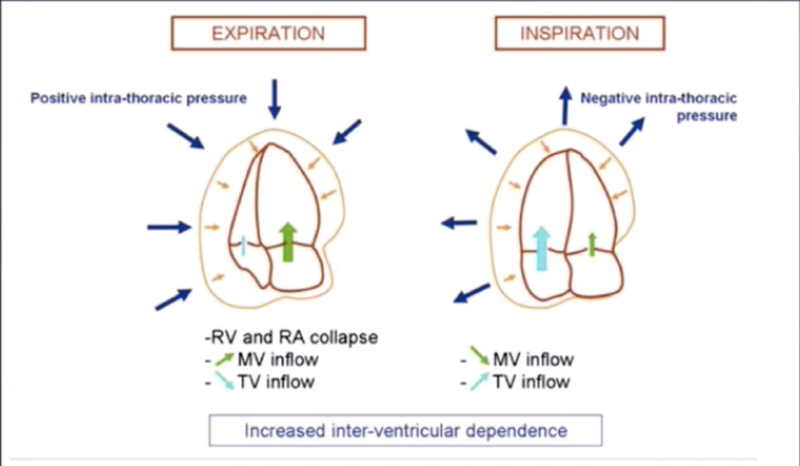 MV/TV inflow variation: With a pericardial effusion, the ventricles take on more interdependence (see image above) since they now have a limited space to expand from external fluid compression. Normal respiratory variation in LV flow will be exaggerated in tamponade resulting in pulsus paradoxus. This can be visualized by ultrasound using pulse wave doppler gate at the mitral valve or tricuspid valve. Normal change in flow is 15% at MV, 25% at TV. Any more than this is concerning for tamponade. Obtain a subcostal long axis view to assess for a distended, non collapsible IVC which would suggest high filling pressures and possible tamponade. THE CARDIAC ANATOMY DRAWING IMAGES WERE PROVIDED BY THE YALE ATLAS OF ECHOCARDIOGRAPHY. MORE ON CARDIAC US CAN BE FOUND IN 'INTRODUCTION TO BEDSIDE ULTRASOUND', VOLUME 1 & 2, FROM DR. MALLIN AND DR. DAWSON. IF YOU ARE INTERESTED IN PURCHASING THESE EBOOKS FOR LESS THAN $1, VISIT ULTRASOUND PODCAST CONSUMABLES. Emergency Echo at Emergency Ultrasound Teaching.